German Potato Salad | Om nom nom! I was looking for a mayo-less potato salad…I’m not a huge fan of taters in the first place, and mayo salads even less. Though I do recognize that many people are fans of both ;), I didn’t feel like a salad of that type went with our Memorial Day cookout menu. I found this on Chowhound, and was very pleased with it – even I ate a serving! It has done well leftover too, and is even more flavorful. The only thing I did differently from the original recipe was that I served this cold, and the general consensus preferred it that way as well. Cook the bacon until it’s crisp and drain on paper towels. Chop the pieces coarsely, place in a medium bowl, and set aside. In a large pot, cook the potatoes in lightly salted water until tender but not mushy. Drain, cool slightly, and slice (unpeeled) into thick rounds. Return to the empty pot. 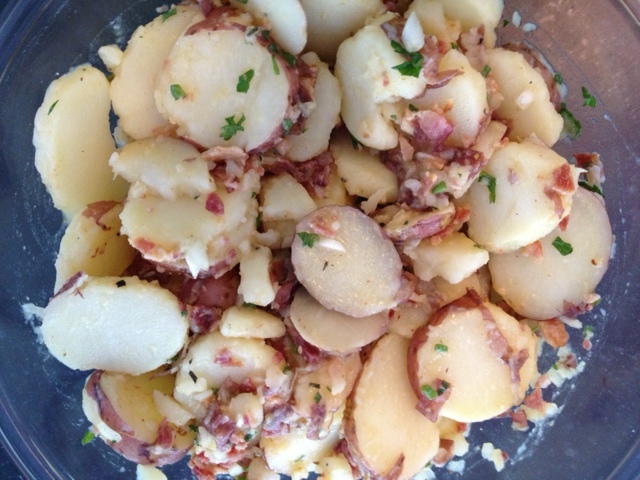 While the potatoes are still warm, gently mix in the reserved bacon, onions, and herbs. Set aside. In a large bowl, mix up the mustard sauce by combining all the sauce ingredients. Add the potato-bacon-herb mixture while gently stirring. Season to taste with salt and pepper, garnish with the eggs, and serve warm.